Until you tour a bourbon distillery, you don’t really know what the spirit of America smells like. Oh, sure, you’ve whiffed hot dogs on the grill, a fresh-baked apple pie, just-mowed lawn, a forest after a rain shower, a crowded bus, and even a horse farm. 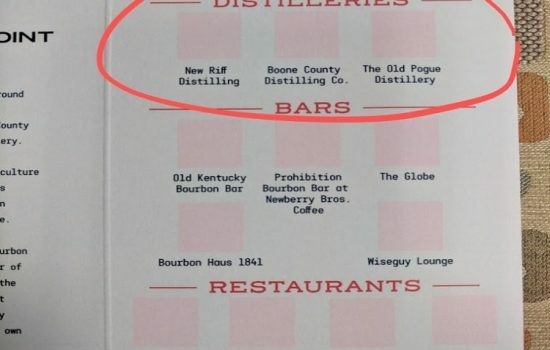 But only bourbon is “America’s Native Spirit,” an honor bestowed upon bourbon in 1964 when Congress officially declared it a “distinctive product” of the United States. 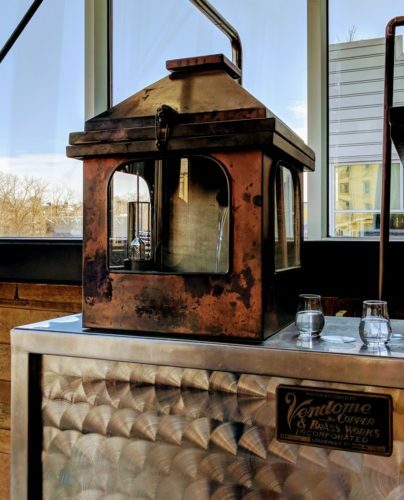 The B-Line adds a new twist to Kentucky bourbon country as it showcases three distilleries, five cool bourbon-centric bars and four snazzy restaurants in Downtown Covington and the surrounding hills of Northern Kentucky. Grab a free Line Guide at any participating stop on The B-Line and get ready to “find your sipping point” in Northern Kentucky, which was designated an “Official Gateway to the Kentucky Bourbon Trail®” by the Kentucky Distillers’ Association in 2017. Collect free stamps in that Line Guide as you go; once you collect two in each category, cash it in for some cool free swag. When poured into a glass, bourbon wafts a complex mix of vanilla, caramel, toast and other aromas. That’s the end of the story, not the whole story. 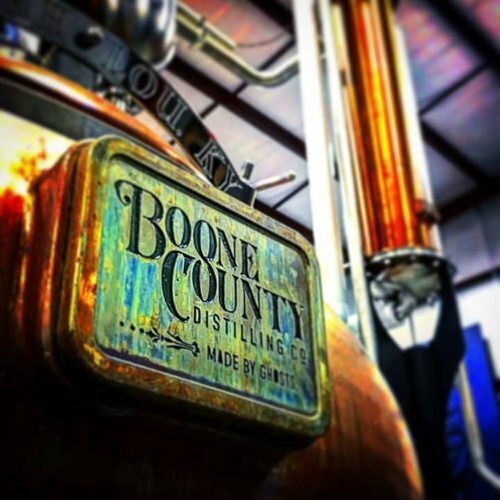 While walking around a distillery you’ll smell the corn, malted barley and rye or wheat used in the sweet or sour mash. Each step in the production process has its own perfume, from the dusty grain mill to the sterilized bottles, from the limestone-filtered water to a copper pot still and fresh-charred barrel. Stand in a rickhouse alongside the angels and breathe deep. That heavenly scent is pure American spirit. All bourbon is whiskey, but not all whiskey is bourbon. To qualify as bourbon, it must be made of at least 51 percent corn, aged in new charred oak barrels, and made in the U.S.—bourbon doesn’t have to be made in Kentucky, but 95 percent of it is! 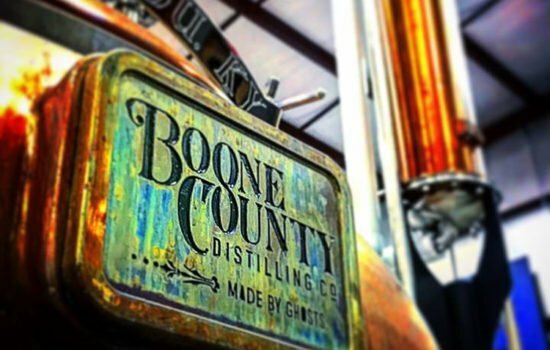 Boone County Distilling Company, which opened in 2015 in Independence, pays tribute to early pioneers who crafted spirits in Boone County over a century ago. Its tagline, “Made by Ghosts,” honors original whiskey makers. Tradition, history and lore are acknowledged throughout the facility and production process in details such as plastered quotes from ancient diaries on the wall and the 500-gallon copper pot still named “The Bear” for legendary distiller William Snyder’s pet bear. (Yes, he had a pet bear until his neighbors wisely persuaded him it wasn’t his best idea.) Current production is about 10 barrels a week and all the necessary equipment is in the distillery behind the tasting room and gift shop, including four fermenters and a small bottling line. A 3,000-square-foot warehouse beyond the distillery is where barrels lie in wait and where the best aromas linger in the air. Tours end with tastings of white whiskey, straight bourbon and bourbon cream—all products’ names have some tie to history with interesting tales that range from tomahawk battles to tavern treats. New Riff Distilling, launched in 2014, is family-owned and proudly independent. The aim is to take spirit-making traditions in a new direction without compromising quality and craft. Housed in an eye-popping sleek glass structure in Newport, the distillery boasts a three-story copper column still plus a copper pot still. The column still produces about 12 gallons of whiskey each day (annual production is expected to reach 9,000 barrels). While corn and rye are directly fed into the column still from silos, a side conveyor allows distillers to add any grain into the distilling process—which means distillers can create a range of innovative whiskeys. New Riff produces several other spirits including Kentucky Wild Gin. Its first bourbon, which has been aging for four years, will be released later this year. Peek at all levels of the distillery inside the northernmost stop on the Kentucky Bourbon Trail Craft Tour®. Tours include tastings of select featured products; cooking classes and special programs are also offered throughout the year. The Old Pogue Distillery, in Maysville, is Kentucky’s “No. 3” registered distillery. Originally launched in 1876, it operated through Prohibition (manufacturing “medicine”) but was abandoned in 1933 (blame the economy). After it sat empty for years, descendants of the founders regained ownership of the property and reintroduced the brand in 2004. 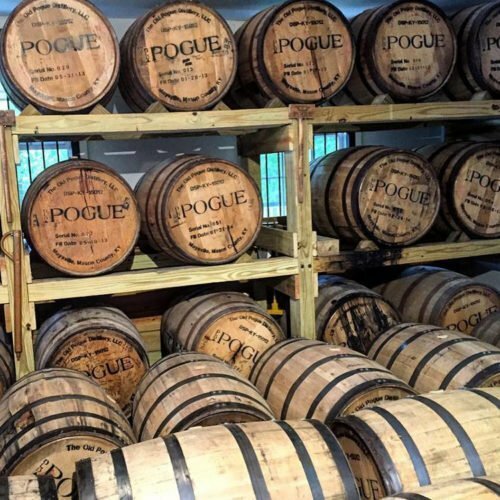 Time-honored traditions endure as 5th and 6th generation Pogues use original recipes they inherited to produce small batch bourbon and rye spirits. Tours include a peek at the distillery’s copper pot and stainless steel column stills and step into the house where the tasting room is located. Antique bottles, maps, family photos and other memorabilia are on display providing plenty to look at as you sip and savor. The distilleries on The B-Line are all artisan crafters, so your tour guide might also get elbow-deep into bourbon production—which means if you have a question, you’ll get an informed, accurate answer. Tours reveal the distillery history, walk through the production process, showcase behind-the-scenes realities, and end on a happy note with a tasting. 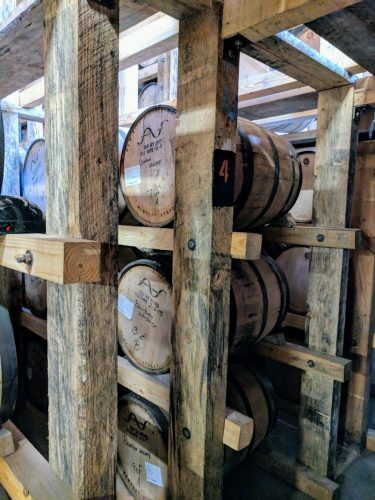 Some aspects of bourbon-making are common to all distilleries, yet each distillery has its own quirks, tricks and habits so it’s definitely not a “you’ve seen one, you’ve seen ‘em all” situation. From tradition to innovation, the trio of distilleries on The B-Line presents modern-day bourbon techniques and results. Consider them all can’t-miss destinations. And maybe after your visits to the amazing distilleries on The B-Line, you want some more whiskey love. 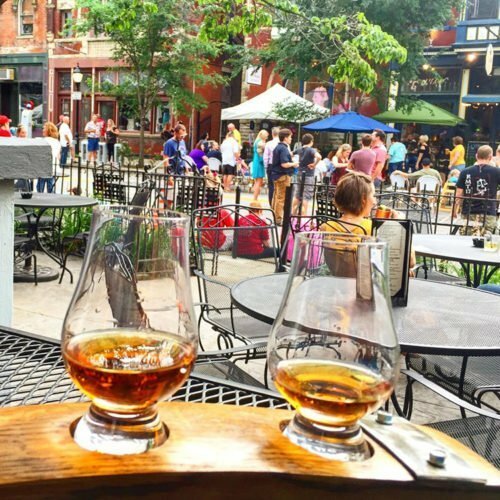 We have you covered in Northern Kentucky with two additional distilleries that are can’t miss stops: Second Sight in Ludlow and Neeley Family in Sparta.